The distinctive Round Architectural Plaque! 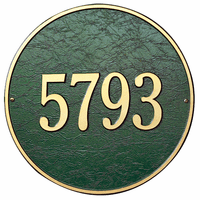 The 6" x 6" in diameter is a one line wall version that holds up to three 3" characters. The 9" x 9" in diameter is a one line wall version that holds up to five 3" characters. The 15" x 15" in diameter has both a one line wall and a lawn(with 18" lawn stakes) version that holds up to three 7" numbers or five 4.5" characters.